How your credit card limit is determined? But one aspect remains shrouded in mystery -- the credit limit. Just how is it determined, anyway? Your credit score is a number that rates how you've handled your financial life, including whether you've paid your bills on time, how much debt you carry compared to available credit and how long you've maintained credit accounts. The higher the score, the more likely you are to get a higher credit limit. With a low credit score, you might have a hard time qualifying for a credit card, period, or you might have to pay high rates and fees for a credit limit of only a few hundred dollars. After you've paid your credit card bills on time for six months or more, the issuer might boost your credit limit to reward good behavior. But don't celebrate with a spending spree. The increase doesn't mean you can afford it. Your income and obligations, including other credit card debt, are considered. In fact, under new federal regulations, you can't get a credit card without a cosigner if you're under 21 and don't have regular income to pay your bills. You can always ask the issuer for a higher credit limit. That doesn't guarantee you'll get it, but you'll have a shot if you can show you've handled the account well. Don't take your credit limit too personally. Many credit card companies have slashed credit limits in reaction to previous over-lending before the recession. 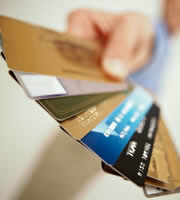 In fact, some customers have found their credit limits cut after taking pains to pay down their credit card debt. No matter what your credit limit is, keep your balances as low as you can. Experts advise a good target is 30 percent or less of your credit limits. Using too much of your credit hurts your credit score, which limits how much credit you can get later and impairs your chances of getting low interest rates for other credit cards and loans. 0 Responses to "How your credit card limit is determined?"